Mediterranean monk seal (Monachus monachus) distribution had covered all over the coasts in the Mediterranean basin including the Black Sea and in the eastern Atlantic coasts from Portugal to Senegal in the west Africa until the beginning of 20th century represententing a population in the order of thousands. However, this rare marine mammal declined very fast in its distribution range mainly due to hunting and deliberate killing in the first half of 20th century while during the second half of the 20th century, habitat destruction -in the form of both degradation and fragmentation of the habitat– , incidental net entanglements and disturbance in their caves played the crucial role for the decline of monk seals. In the world, viable Mediterranean monk seal populations today exists only along the coasts of Türkiye, Greece, Mauritania and Portugal (Madeira islands) with a population of approximately 750. The population in western Sahara represents the true Monachus monachus colony in the world with a compact and healthy population living on the open beaches exposed to the Atlantic ocean. However, monk seals in the eastern Mediterranean had to prefer living isolated in very small groups or mostly alone. Although scattered, the biggest population in the world exists in the Aegean Sea. Therefore, responsibilities of Greece and Türkiye are huge for the protection of the species and its pristine habitats in the Mediterranean. It is estimated that around 100 monk seals exist along Turkish coasts while there are 60 monk seals individually identified through the field studies by by SAD-AFAG until now. Considering the world population, this number refers an important proportion. Hence, Türkiye plays an important role for the protection of Mediterranean monk seal Monachus monachus as a world heritage. Mediterranean monk seals show interrupted distribution ranges along Turkish coasts instead of a continuous distribution range. In the NE Mediterranean; the coasts between Datça and Kemer, the coasts between Gazipaşa and Taşucu (Cilician coasts) as well as the coast between Samandağ and Syrian border. Breeding regularly occurs in the country while monk seal deaths are sometimes observed in some coasts. Mediterranean seals live “along the remote and untouched coasts that have no urban development, or coasts difficult to be accessed by man or far away from human activities, and rocky/cliff coasts preferably having coastal caves or caverns for breeding and/or resting purposes” and it is directly affected from deterioration of habitats. On the other hand, it is not possible to state monk seals do not exist in the coasts other than above referred coastal types such as beaches or inhabited coasts in Türkiye. It is known that Mediterranean monk seals sometimes go out of the desolate, rocky coasts and for time to time widen their roaming area especially for foraging. And even it is known that they may be observed around sandy or pebble beaches or an estuary of a river, although rarely. Yet, primary habitat of Mediterranean monk seal is remote and untouched coasts. As they are large marine mammals, they can not survive in narrow ranged habitats. The species can only breed safely in the case of existence of a coastal segment with optimum size and having suitable breeding cave. Mediterranean monk seal is a large marine mammal and its length varies from 2,2 meters to 3 meters and its weight is roughly between 200-300 kg. Not longer than 0.5 cm., hairs cover the skins of adult seals densely. When they are seen swimming on the sea surface, the most outstanding feature is huge head without ear tufts, long whiskers and jet black eyes. There is no huge difference in terms of weight and size between males and females, however, they have characteristic colour distinction. Their large size is easily recognized when they are observed lying on shore. There are fore fins on both side of their body and back fins in two parts at its rear. Male: There is a distinct white patch on abdomen while its overall color is nearly black or dark brown. Size and shape of white area on abdomen vary among individuals. Female: Top is slaty grey and underpart is paler or nearly white from neck to tail. Moreover, on the waist there can be a white patch in irregular shape formed by scratches made by males during copulation. Pup: New born has nearly 80-90 cm length and 20 kg. weight. In abdomen region, a white birthmark is seen without exception. Its body is covered with glossy and longer black hairs of 1-1.5 cm. When it is nearly 2 months old, it begins to moult and in 2-3 months period long black hairs are replaced with short and glossy grey hairs. Mediterranean monk seals are very timid and are less social animals when compared with other fin-footed species. East Mediterranean populations live very scattered and they rarely gather together. Monk seal sightings occur generally as a single or some times two individuals, while 3 to 4 seals are seldom observed wandering together. Like many of their characteristic feature, there are not much information about their behavior as well. Females seek suitable shelters, coastal caves with air inside and haul out site for resting and breeding. Adult males sometimes keep a territory and continue to live in a selected local territory. Females are more wanderer than the males and in breeding periods, they don’t abandon the breeding cave and vicinity. Young monk seals can reach far regions in a couple of months. It is supposed that female Mediterranean monk seals take very long ways so as to mate with males and then they leave territory of males after mating. Copulation occurs in the sea. It is supposed that female seals reach the sexual maturity approx. at the age of 3 years. After the period of 11 months of pregnancy, the female Mediterranean monk seals give birth a pup every year or two years. Therefore, breeding rate of Mediterranean monk seals is low and combined with threat factors, population remains low. Birth takes place along inhabited coasts and at the end of a cave having a haul out platform of sandy beach or a rocky platform to which waves cannot reach easily. Mother suckles its pup nearly for 4 months with her milk in a cave on the platform. Mediterranean monk seals are certainly in need of land to give birth and raise their pups. Today, coastal caves serve as the ultimate places for breeding of the species. Since Mediterranean monk seals depend both sea and coastal territory, protection of coastal habitats is of utmost importance for the continued survival of the species, which must be taken into account in conservation plans and measures regarding conservation of the species. Mediterranean monk seals are carnivorous, which is the common feature of pinnipeds (fin-footed animals). Octopuses, wide variety of fish species, lobster are among its food. When a monk seal hunts its prey, especially when the prey is big, it takes them out of water and toss in order to kill prey and eat it in small pieces, eating piece left in mouth and catching remaining piece by swimming after it. It continues in the same way till prey is eaten fully. 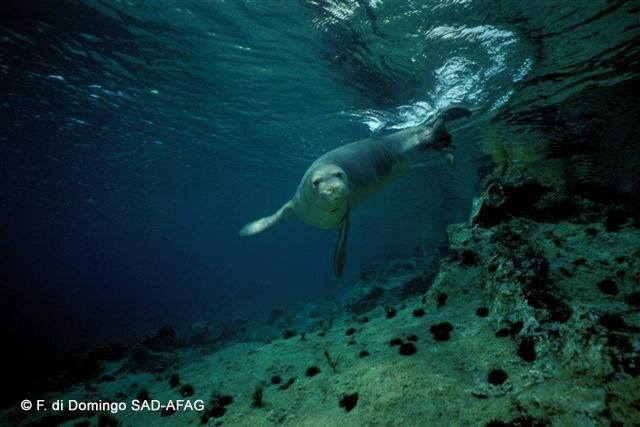 As the Mediterranean monk seals are mammals, they have lungs and make respiration with air. In sea, they dive into bottom by using air that they take on surface. Mediterranean monk seals usually dive for 5-10 minutes and surface again for short periods to re-breath. Mediterranean monk seals are known as shallow water divers compared with other pinnipeds (fin-footed animals). It is known that they dive generally shallow waters less than 100 m. while the deepest dive is 180 meters. From time to time, they are known to take fish from the artisanal fishermen’s set nets. This situation causes competetion which may result in deliberate killing of monk seals by artisanal fishermen. Mediterranean monk seal Monachus monachus belongs to subordo Pinnipedia in the animal kingdom. In Pinnipedia (=fin-footed), monk seals are within the “true seals” family which thrives only along Mediterranean coasts and on west African coasts and Madeira Islands in the Atlantic. The systematic classification diagram, which includes the total 34 pinnipedia species in the world, is given below. Hawaiian monk seal Monachus schaunslandi, also considered an endangered species according to IUCN, have a population of around 1.500 and survives in the Hawaiian islands in the Pacific Ocean. Carribean monk seal Monachus tropicalis, one of the 34 Pinniped species, unfortunately disappeared in its range with the last confirmed sighting in 1952. Therefore, now there are 33 pinniped species left in the world. You are to wait for months to see Mediterranean monk seals nowadays; but in 1950s it was seen even in the Strait of Istanbul and even they were breeding here. It is a very tragic event when considered that in life span of a human, the Mediterranean monk seals are about to be extinct. In the world, the predator of the other seal species are marine animals for example, killer whales, leopard seals, sharks, polar bears and jackals. Well, who is the enemy of the Mediterranean monk seal living in our seas? What a pity that the reasons for the extinction are not the natural factors. The only enemy of the Mediterranean monk seal is human. The human greed acting against nature makes Mediterranean monk seal and valuable coasts become diminishing or even extinct. This type of human behaviour occurs as a result of selfish attitude of human being as his natural characteristics. When it is said human, it means that greed and ambition hidden in human activities related with money; spreading along pristine coasts, construction of new roads that facilitate coastal developments, approval of tourism projects in natural bays, marine pollution, deliberate killing of seals (in the past in the form of hunting for their skin and fat), illegal fishing especially by means of trata, purse seiners and trawlers are among the destructive nature of human being. Unfortunately, monitoring of these illegal or unplanned activities are not supervised properly in most cases. The extinction of the Mediterranean monk seal doesn’t take root from one problem. The five factors play role for the extinction of this rare species along Turkish coasts. How do these factors contribute the extinction process? 1. Deterioration of Coastal Habitats: The most important reason for the decrease in the number of Mediterranean monk seal (or even its extinction in certain locations) is the deterioration of coastal habitats. The habitats of the monk seal are untouched and remote coasts that still keep their natural form. In Türkiye, some of such pristine areas have been gradually declining. As the roads are opened along such coasts and construction of the secondary houses or touristic development destroy the natural characteristics and pecualirity of coasts, such remote coastal areas are left by monk seals. 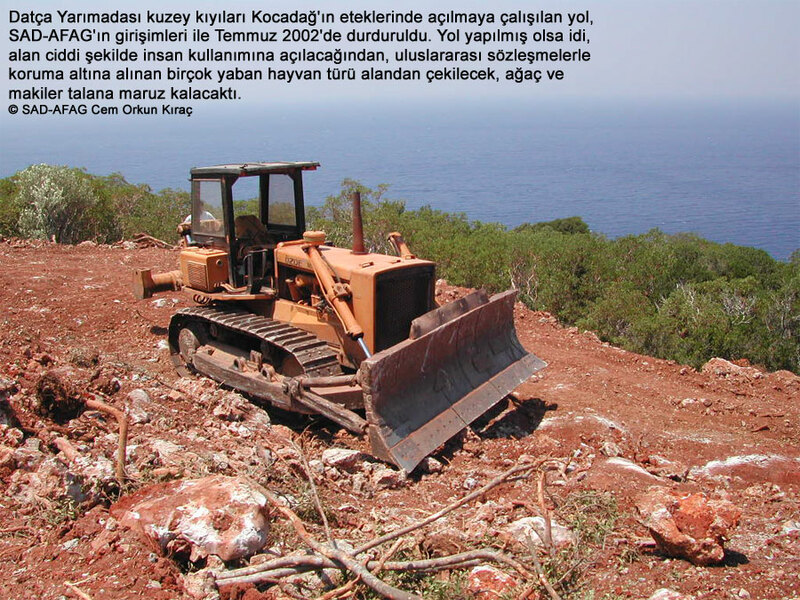 In Datça Peninsula, the road construction was started and thanks to conservation efforts initiated by SAD-AFAG it was stopped in its initial construction stage 2002. Küdür Peninsula, Yalıkavak, Bodrum (SW Turkish coasts) has been under protection for monk seals since 1990s. Although the majority of the Küdür Peninsula is still undeveloped and not urbanized, a huge “development” pressure towards whole Küdür peninsula is observed in the recent years. Moreover; this negative factor not only affects the Mediterranean monk seal but also the arcaeologic sites that has a history of thousands years belonging to ancient civilizations including Phrigs, Ions, Lycians and Carias along Anatolian coasts. Besides, habitat destruction causes the natural landscape to be deformed, the fertile agricultural areas to be devastated and historical values & cultural traditions to be corrupted. Mediterranean monk seals live in the desolate coastal areas where there are no human activities, which are generally rocky and rugged geo-morphologic character and are mainly state-owned lands. However, state-owned lands are sold or rented for development or tourism purposes thus there will nearly be no room left for wild life including endangered marine and coastal species including Audouiin’s gull, Eleonarae’s falcon, grouper, posidonia sea grass, sea turtles and monk seals. Besides, it is thought provoking to let the state-owned coastal lands, that are the common heritage of 74 million people in the country, be housed & developed through an unplanned construction & development process, sacrifying also valuable olive and orange yards and other agricultural fields on which hundreds thousands of local people are dependent. 2. Overfishing and / or illegeal fishing: Aqua products such as several different fish, octopus and lobster consist of foods of monk seals. The fish stock has been decreasing largely because of illegal and/or over fishing methods (trawlers, tratas, purse-seiners, dynamite fishing, spear fishing with scuba dive or torch). As a result, both seals foraging in the shallow seas and small scale (artisanal) fishermen are affected very negatively; the seals can not have enough food, which shall have direct effect on physiology and breeding success of animals while coastal fishermen suffer from lower incomes and their life standards drop. Unless concrete solutions are found to this problem, monk seals (and other animals on top of food web) will receive great harm or even become extinct at certain locations while fish prices will be higher in the country. If overfishing and illegal fishing continues in this rate, devastation of the marine ecosystem is unavoidable. 3. Deaths: Deaths happen in two ways; 1- deliberate killing and 2- entanglement to fishing set nets by pups and juveniles. Due to the decrease in fish stock, the competition between seals and small scale fishermen has been ascending as they hunt in the same waters. Artisanal fishermen may sometime show great reactions even they suffer small amount of fish losses due to monk seals because they have already lower incomes and poorer. Sometimes, artisanal fishermen dare to kill monk seals they encounter a seal during fishing because of their intolerance under certain circumstances. Now let’s ask the question for this dilemma; who is the guilty for this vital competetion? the fishermen who kill the seal or the seal that takes fish from the fisherman’s net to survive? In our opinion, not both. In fact illegal trawlers and purse-seiners and also the competent bodies that are insufficient to supervise the illegal and over fishing are the responsibles. Unless the root-cause is not solved the closed circuit problem between artisanal fishermen and endangered monk seals will prevail for sure. Monk seal pup found dead along Turkish coasts (c) SAD-AFAG M.Manav 2009 Deliberate killing are reduced in the recent years especially after 2000’s. Juveniles are more susceptible against entanglement to set nets which leads to drawning in couple of minutes. 4. Disturbance in monk seal caves: The key places where monk seals survive (breed, raise pups, hide and rest) are the coastal caves, either underwater entrance or from surface. In the recent years, seal caves have been disturbed under the tourism pressure and several caves are abondoned by the seals because of the disturbance given by divers. Cave diving activities are organized by the diving companies especially after 1990’s in Turkiye. Caves are visited to show off monk seals in their caves mainly with u/w entrance, hence, caves may be abandoned by seals due to disturbance. Although it is banned to penetrate into monk seal caves in accordance with the relevant regulation; some diving companies deliberately guide tourists to dive into monk seal caves especially in Bodrum, Marmaris, Fethiye, Kemer, Kaş and Alanya areas. Due to nature of the coastal caves (remoteness and sporadic distribution of the caves as well as difficult locations to reach) in Türkiye, it is very difficult to make frequent patrolling by the competent authorities to control illegal monk seal cave dives on site. 5. Marine pollution: As a result of the marine pollution specifically the pollution in habitat of monk seals, seals gradually reduce using their habitats which may finally result in abandonment. Actually we rarely face with this problem in the country yet it is potentially dangerous. It is stated that there is also some heavy metal accumulation in Mediterranean monk seals proven by the previous scientific research. The followings can be given as the examples of the effect of pollution on the species in Türkiye: In Çavuş Island near Gümüşlük is one of the important seal habitat and an oil pollution occurred in 1996. In Sinop Inceburun Cape during a field research, a heavy marine litter due to land based pollution were observed (nylon bags, ropes etc.). Although it is rare, it was observed that ropes or similar waste items can curl head and neck of the seals. The oil spill happened in Çavuş Island, Bodrum SW Türkiye in 1996, affected the habitat of the seals, and a rope tightly squeezed the head of the monk seal named “Dişi korsan” in Foça in 1998 are concrete examples of pollution in the country. However, pollution has never been a primary one among the threats along Turkish coasts mentioned above. Kıraç, C.O., Y. Savaş ve H. Güçlüsoy. 1998. Akdeniz fokunun Monachus monachus Önemi ve Türkiye’de Korunması. SAD-AFAG Yayınları. Eylül 1998, Ankara. 21 sayfa + anket. (Importance of Mediterranean monk seal Monachus monachus and its protection in Turkey. SAD-AFAG Publications. September 1998. Ankara. 21 pages + questionnaire. Original in Turkish). Kıraç, C.O., Veryeri, N.O., Güçlüsoy, H. and Savaş, Y. 2013. Conservation of the Mediterranean Monk Seal (Monachus monachus) in Turkey National Action Plan. The Republic of Turkey Ministry of Forest and Waterworks, RAC/SPA & SAD-AFAG. 48 Pages+Annexes. Ankara, May 2013.